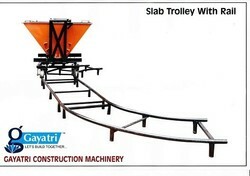 Providing you the best range of slab trolley with effective & timely delivery. Our company has been widely acclaimed in the field of manufacture, supply, export and wholesale of Slab Trolley. These trolleys are extensively used for evacuating materials from one place to another place. These have great mobility and their Tilting Bucket Rotates through 180 Degrees which have excellent balance and contain Plates and Ball Bearing. Last but not the least these have Wheels With Ball Bearing. Rails: 'C' Class M.s. 32 mm Dia Pipe With Supports& Interlocking Pipe Connection Arrangement. Size : Rails - 10 Running Feet Rails / -5 Rft - 7 Rft Straight Rails Are Provided. Two 10 Rft Bend Rails Are Also Provided. Total 100 Rft Rails Are Provided. Optional : Revolving Trolley Centrally Balance With The Help Of Plates And Ball Bearing / Thrust Bearing Is Also Manufactured. Looking for Slab Trolley ?